Home » Garden and Outdoor » Best Brush Killer – Clear Your Yard Fast! 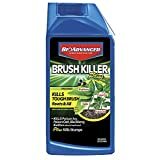 Best Brush Killer – Clear Your Yard Fast! With spring in full swing, and summer on the way, the last thing you want to deal with is unwanted shrubbery and bushes taking over your yard. There are bushes and hedges that just can’t be tamed with a pruner! The easiest alternative is finding the best brush killer on the market. 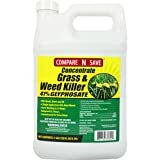 If you don’t want to have to get rid of your shrubbery all together, then weed and brush killer herbacide might be the next best option. The common brush killers, triclopyr and glyphosate, are highly effective at killing shrubbery and can also be used to clear wild shrubs if you wish to clear the land for cultivation. 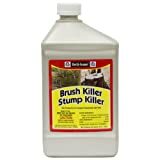 When you apply the brush killer, you want to try and use it just before the plant goes into it’s dormant period. This is when the tree is pulling the most substances down to it’s toots, and the brush killer will be most effective. Triclopry is the best option for woody shrubs, and glyphosate concentrates work best on any other vegetation. Be careful, becuase the killer is indicriminate and will kill all the vegetation it’s applied to, whether you intended to, or not. Apply your concentrate on calm, non-windy days, to avoid spraying items you don’t want to, as well as avoid spraying yourself. Don’t use it near any fish ponds, as most are toxic to fish. You should also keep your pets and kids out of the area until the concentrate you sprayed is completely dry. Controls most unwanted trees and brush. Use on rangeland, grass pastures, non-crop areas. Special penetrating formula, kills even the toughest plants down to the roots. Kills kudzu, poison ivy, poison oak, blackberry and wild bramble. Plus kills 70+ Other types of weeds and brush. If you’re tired of dealing with excess shrubbery and weeds, and you don’t want to deal with manually pruning it by hand, shrub and brush killer is the way to go. It is safe and easy to use, and will help you save hours of work in the yard.